We could be described as suppliers of printed cards and gifts for church card stalls, which are popular both for fundraising and as a quiet form of mission. They also have a wide range of gift items suitable for church bookstalls if you want to expand what you want to offer your visitors. My rule of thumb is that gifts with a simple spiritual or Scriptural message, which cost no more than the price of a cup of coffee, usually work well in bridging the culture gap with those who are not Christians already. 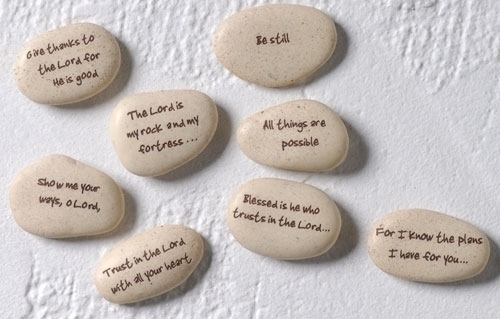 As these stones carry a Scripture they do not appeal to the light fingered and cannot be sold “down the pub”….but they do appeal to those visitors who find themselves on a Spiritual journey in some way. Tim can be contacted by email: sales@timtiley.com or go to their website where you can see the wide range of items on offer.